CONGRESS HAD SPECIFIED THAT the new Mint Act of June 28, 1834 would go into effect the following August 1. Mint Director Samuel Moore anticipated that enormous numbers of "old tenor" (1795-1834 Motto) gold coins of all denominations would be brought in for recoinage, being worth by now considerably above their face value as bullion. In preparation for this flood of coinage orders, he instructed Engraver William Kneass to prepare a large surplus of working dies, omitting the motto E PLURIBUS UNIUM to facilitate distinguishing the new coins from the heavier "old tenor" pieces. Kneass, for reasons which may have had to do with uniformity of design in all denominations, chose to copy the old John Reich "Classic Head" design, first seen on cents 1808-14 and half cents 1809-11, more recently on half cents coined since 1825. The eagle was a somewhat sharpened-up version of the one Reich had designed for gold coins of all denominations in 1807. We may take it as more than coincidence that the half cents since 1825 bore this head rather than any other. Reich's design—probably on grounds of jealousy, possibly because of its androgynous character (the hairdo is masculine by ancient Greek standards, the fillet was worn by boy athletes as a prize for winning town games, never by women)—had been replaced in 1816 by the superannuated Robert Scot, who created possibly the ugliest head of Ms. Liberty ever to appear on a U.S. coin. Reich quit the mint at once, alleging inadequacy of salary (no raise after ten years of service and increasingly large work output), but almost certainly the professional rebuff had something to do with it. But Scot died in 1824, and the next half cents to be issued after that date bore not any new design (which they might well have) but the old and esteemed Reich "Classic Head" portrait. And so it was honored in 1834 by being chosen for the new quarter eagles. The flood of gold deposits anticipated by Director Moore began at the end of June and increased during the next couple of years, and issues of quarter eagles beginning on August 1 exceeded an expectations. A total of some 910,753 through 1839 came from the Philadelphia Mint bearing this design, plus 57,475 from the newly built Southern branch mints at Charlotte, N.C., Dahlonega, Ga., and New Orleans, La., all with mint mark above the dates and in insistent demand as type coins. The Philadelphia total for 1834-36 alone is over ten times the total quarter eagle coinage with motto since 1796. With large mintages, one would expect the coins to be relatively common. 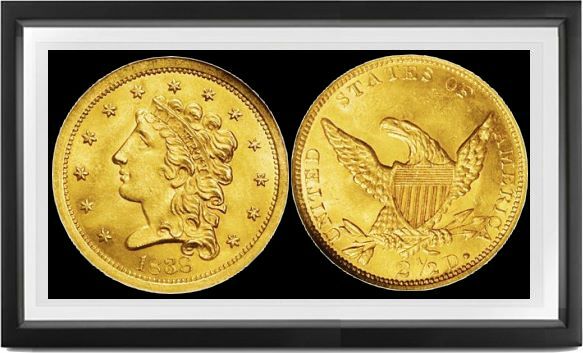 In actuality, any Classic Head gold coin in full Mint State is a great rarity; these coins went into circulation at once and stayed there, few being saved as souvenirs. Branch mint specimens are especially hard to find in Uncirculated condition. There were several very minor design modifications. Coins of 1834 come with two different heads, the one placed well away from date being called the "small head," that with large 4 almost touching curl the "large" or "booby" head; this has thicker lips, eye more deeply set in, profile a little more jut-jawed. Coins of 1835 show a taller head with narrower bust, the upper ribbon end almost concealed by a curl. Coins of 1836 usually have the 1835 bead, rarely the 1834 "booby" and almost equally rarely a head continued through 1837, which has hair above brow sloping far back, very distant from 6th star. Coins of 1838 have a rude imitation of the 1834 "booby" head, larger with tiny stars, evidently made by Christian Gobrecht on an off day, and modified slightly on the branch mint coins and the various 1839 issues. But with the adoption of the new Coronet Head concept (1839/40), copied from a head of Venus in Benjamin West's "Omnia Vincit Amor," Gobrecht was to standardize the design: 67 years of stereotypy following five years of continual change.